Fans of the Scrapper Poet know that I love collections that explore a specific sense of place, and that is what I love most about Bruce Snider’s Paradise, Indiana. I won Snider’s book during the Big Poetry Giveaway from the poet Shara Lessley (whose book, Two-Headed Nightingale is another great read!). You can find out more information about Paradise, Indiana here. I’m sorry to say that this may be the summer of little to no blogging! Next week, besides finishing up my creative course, I will be teaching a Young Writers Studio at JCC. In conjunction with teaching, I will also be spending the week back at Chautauqua listening to various writers including Norman Lear, Meg Wolitzer, and Billy Collins. More good news: I actually have drafted two new poems in the last few days. Hopefully, when June is over, I can take a close look at my drafts and my manuscript and dedicate July to finishing my collection. I always have trouble adjusting to real life after I come home from a writing retreat or a conference. It’s like getting a taste of some sort of utopian world — where you have unlimited time to write and study and socialize with others who love the written word as much as you do. I also admire those who can summarize their travels in a concise manner. I feel like I ramble when I try to write about any type of writing festivities. Still, as always, (this is the fifth time I have attended the Chautauqua Writers’ Festival) the weekend was a blast. A few highlights include meeting up with my old mentor/professor Judith Vollmer, listening to Martin Espada’s reading which included one of my favorite poems of all time, “Alabanza” and learning about the work of nonfiction writers Valerie Boyd and Natalia Rachel Singer. It’s actually Singer’s work I’m thinking about this morning as I type this post. At her reading, Singer spoke about her most recent project, a blog Winter With Zoe, that chronicles a year with Zoe, her dog dying of cancer. I’m paraphrasing what she said just a bit but she opened her reading with these words: “If you love a pet, you are destined to get your heart broken.” I’m not sure why I’m thinking of her words this morning. It’s a gray sort of day outside. The rush of the conference is over, and real life is settling in. I think it’s because her blog is uplifting, encouraging us to live as a pet would live, and that is to live in the moment, not worrying so much about the future. I know that my own mind is always going 100 different directions at once, and most of the time, it’s thinking about the future — tomorrow’s class, next week’s writing seminar, Sunday’s poetry reading, Thursday’s car inspection, today’s doctor’s appointment — the list goes on and on, and that focusing on the here and now is a much happier and healthier place to be. This morning I leave for the beautiful Chautauqua Institution to attend the annual writers’ festival. I’m leaving technology behind, taking only a notebook, lots of pencils, and a poetry book or two. (Okay, okay, I will have my cell phone for emergencies, but you have to understand, my cell phone is simple and ancient. Believe it or not, I really only make phone calls on my cell phone!) Thus, emails will go unanswered and student papers will go unread. I’m looking forward to the weekend. Are you making room for submitting to journals in between all your summer plans? I’m trying….Diane has posted her annual list of journals (Thanks Diane!) that accepts submissions during the summer. Perhaps I will be inspired to get moving with my own summer submissions! So far, my summer has been a series of self-imposed deadlines — some of them having to do with poetry, such as sending out submission packets and working on the poetry unit of my summer creative writing class. But, I haven’t got a whole lot of new poems written. To say that I’m in some sort of writing funk may be an understatement. I am, however, hoping to change all that when I take off on Thursday to attend the annual Chautauqua Writers’ Festival. Sundress Publications is looking for submissions for a multi-genre anthology (poetry, fiction and nonfiction) regarding women and place. Submissions will be accepted on a rolling basis through 2012. Please look here for more guidelines. I worked retail for many years and one thing that my bosses and my mother agreed on was what was “appropriate” for conversation and what wasn’t. Talking about the weather was safe. Talking about religion and/or politics was not. I think about that advice for some reason when I read poetry. I don’t know why. I don’t believe we should avoid politics in poetry. I also don’t believe we should avoid religion. A God in the House: Poets Talk About Faith edited by Ilya Kaminsky and Katherine Towler is a book, obviously, that does not avoid religion. In this collection, the editors bring together 19 contemporary American poets to talk about spirituality and/or religion and the act of writing. This is a collection that does not pass judgement, nor do any writers believe that one religion or path of spirituality is “better” than another. The essays are non-academic in nature, and in general, are must reads for anyone interested in how contemporary poets explore spirituality in both personal and writing lives. 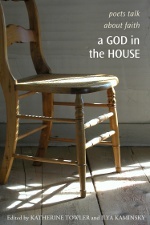 A God in the House is published by Tupelo Press. Take a look here for more information. Calling all Working-class women poets! Editors Carolyne Wright and Eugenia Toledo are compiling an anthology titled Raising Lilly Ledbetter: Women Poets Occupy the Workplace. The deadline for submissions is September 3, 2012. Poets may submit up to five poems for consideration for publication. Please read the full guidelines here.